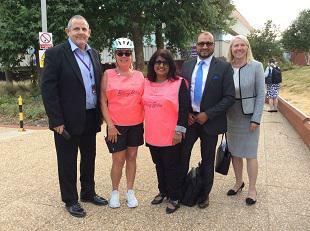 The group which meets every Tuesday evening at the Hounslow Civic Centre on Lampton Road, held their naming ceremony at 6pm yesterday before setting off on their weekly ride. The group has grown out of the free adult cycle training sessions held each week on Wednesdays and Saturdays. The sessions are funded by Transport for London (TfL) with the aim of teaching adults to cycle, or to improve their proficiency. Many who have taken advantage of the scheme were unable to cycle prior to joining. It’s been quite a learning curve for these regulars, to go from being non-cyclists to being confident and proficient enough to take to the road for a 1.5-hour ride covering a distance of approximately 10km. The group has grown in popularity, particularly with Asian women who are often underrepresented in cycling. Last month’s numbers were over 200 attendees. The route changes from week to week and runs from April to the end of September. Participants range in age from teens, to ladies in their seventies. If you would like to give it a try, don’t worry if you don’t have a bike. The scheme includes provision of free bikes, helmets and high-vis jackets, so there really is no excuse! There is no need to register, just come along!